Some people wear braces for months even years, therefore you want to pick a braces color that you’ll be happy with. Red, blue, green, purple, and pink are some of the most common braces colors or you can mix and match to create your own color combination. If you are having trouble picking the right color for your braces, check out these tips and consult with your orthodontist. 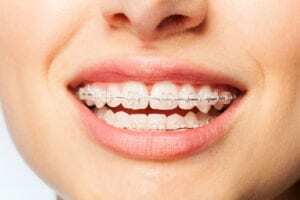 Over the years, we’ve received many questions from patients about braces, but one question that always comes up is “What color braces should I get?”. 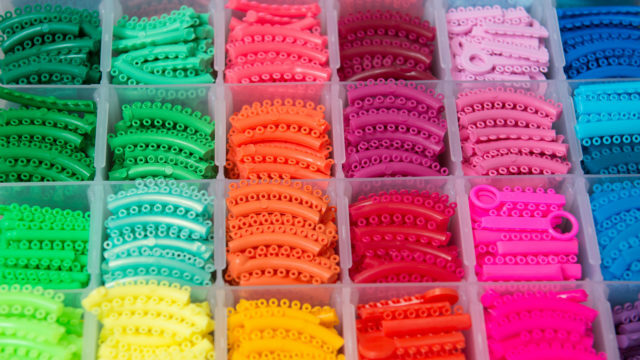 There are many ways to decide what color braces are right for you. Should you pick your favorite color? Should they match your wardrobe? Should they coordinate with an upcoming holiday or special event? These are just a few things to consider when choosing the best braces band colors. White braces sound like a great option, but they can actually turn into an off-white color after drinking and eating certain foods. They can also make your teeth appear more yellow, since your tooth enamel may not be as naturally white as the bands. Darker colors such as dark purple and navy blue make your teeth look whiter because they contrast with the natural color of your teeth. Be careful with dark colors though, dark green and dark brown can give the appearance of food stuck in your teeth. Yellow and gold can bring out the natural yellow of your teeth, making them appear more yellow than they actually are. Not everyone has the same color teeth. For people with teeth that have a yellow tint, it is best to opt for clear or silver bands. For people with a natural white color, it is best to choose black to make your teeth appear even whiter. Favorite color: An obvious choice is to pick a color that you already love! If you have more than one favorite color, you can choose them both for a more unique smile! Match your outfit: Take a look at what colors are most prevalent in your closet and then pick a braces color that is complementary to your style! Adult patients often pick a neutral color that closely matches their enamel, complementing any outfit or occasion. Holidays and Events: St. Patrick’s Day, Fourth of July, Christmas, and many other holidays have signature colors. A fun way to get into the holiday spirit is match the color of your braces with an upcoming holiday. Also, consider coordinating your braces color for any special occasions like weddings or graduations. Your favorite sports team: Show your team spirit by putting your favorite team’s colors on display with your braces! Colors that complement your eyes: Green bands are complementary to brown eyes. Blue, pink, and lilac complement blue eyes; while purple, red, green, and orange intensify green eyes. If you’re really hoping to make your teeth appear whiter than they are, choosing the right braces color is a good start. Darker colors such as black, dark purple and navy blue make your teeth look whiter. If none of these strike your fancy, try red or light blue to make your teeth appear brighter. Sometimes it is beneficial to go with neutral colors. Silver, gray, and clear colored bands won’t make your teeth appear whiter, but they also don’t draw attention to discolorations on your teeth. As always, it is best to avoid coffee, tea, and dark sodas to prevent stains on your teeth and potentially altering the color of your bands. Remember, if you don’t like the color you choose initially, it’s not the end of the world. You can change colors at your next appointment when you have your braces tightened. If none of these options pique your interest, talk to your orthodontist to see if you are a potential candidate for non-traditional braces. Invisalign involves the use of clear aligners, called trays, to straighten teeth. The trays are easily removed to eat, drink, brush, and floss normally. Even though the trays are removable, it is necessary to wear Invisalign at least 22 hours per day to achieve the desired results. Also known as invisible braces, clear and ceramic braces function like traditional braces but with less obvious brackets. 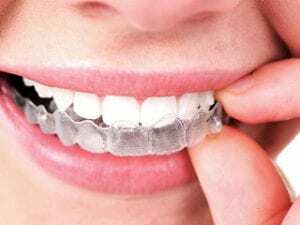 Though they are connected by a thin metal wire, the brackets blend with the natural color of your teeth so they are more discreet than traditional braces. While choosing the color of your braces may seem like an important task, the upkeep of braces and practicing good oral hygiene is just as important! Be sure to avoid certain foods and brush after every meal making sure you clean around the brackets of your braces well. It is also important to visit your dentist every 4-6 months to ensure your teeth are on the right track to a healthy smile!